Year ago when I worked as a postman in Coventry, if you were ever late back to the office after the first post your workmates would jibe you with the line “did you get the bus back with the twirlies?” Back then, pensioners could ride the buses for free after 9.30am but you’d get the odd one trying their luck at twenty past using the phrase “am I too early?” (sounds like ‘twirly’ in midlands twang) if ever a jobsworth bus driver gave them the knock-back. 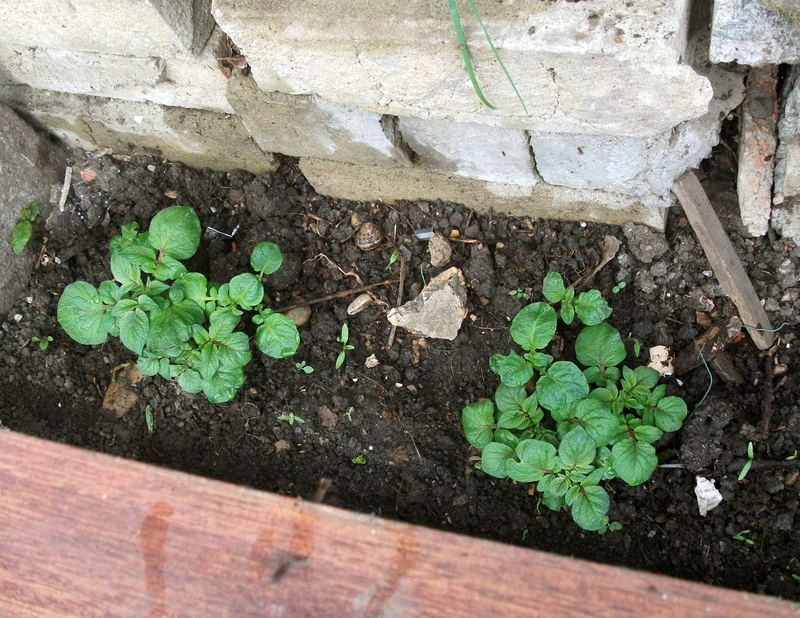 Talking of twirlies, a couple of weeks ago I sowed a couple of seed potatoes in the cold frame and they are now on their way. I’ll have to keep them under cover until the risk of frost has passed which might mean raising the frame up a bit as the plant grows but it’s worth the trouble for those early spuds. I do like a home-grown potato! On the biodynamic calendar it was a “flower” day today so sowed some Borage and Foxgloves in trays on the kitchen windowsill. I transplanted some hardened off Morning Glory seedlings into the new raised bed, putting some jam jars over them just in case the weather gets cold again (which it might) and also moved some self-seeded Poppies from around the garden in there too. This is a very busy time in the garden now, preparing for the season to come and to get a bit of a head start on yourself, so sometimes it does pay to be a bit “twirly”! A weekend fit for gardening or what? Here in the UK it was! Yesterday while thousands of others were sunning themselves crammed onto Brighton beach I was weeding in the back close to the house listening to the excellent slow-mo electonica of Andrew Weatherall on the red bull music academy site recorded in one of the pods of the London eye last year. Lovely stuff! Things are starting to roll now in the garden and not forgetting the windowsill! 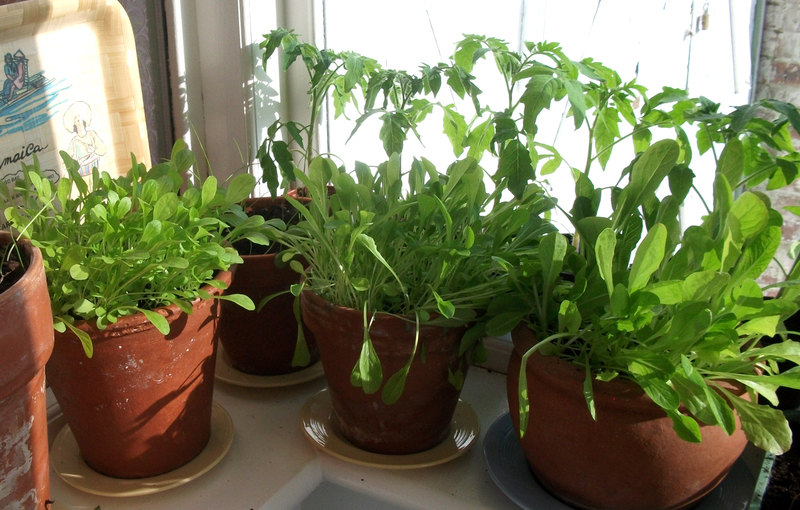 There’s three pots of “cut and come again” cos lettuce mix ready to eat soon. 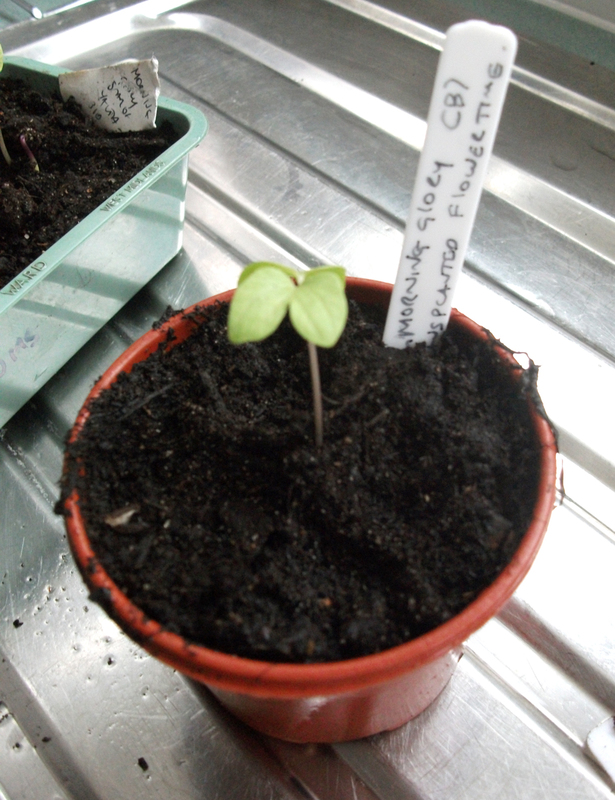 The seeds cost me £2.35 and just add to that the price of a pot of compost, it’s cheap as chips to grow it yourself. As it was “leaf day” yesterday too, I took the chance with the weather and sowed outdoors two sorts of lettuce; artic king and little gem plus some spinach in a part of the garden that throughout the day will get some dappled shade which will stop the plants from bolting and going to seed early. If there’s any sign of frost I’ll stick some fleece or an old net curtain over the seedlings. Today I did another couple of jobs in the garden, including making a very simple raised bed out of a couple of scaffolding boards given to us by the Portugese man with a van (an excellent bloke who does removals and house clearances at a decent rate, contact number on request!) who sometimes uses our garage combined with three end pieces found in a skip last weekend. 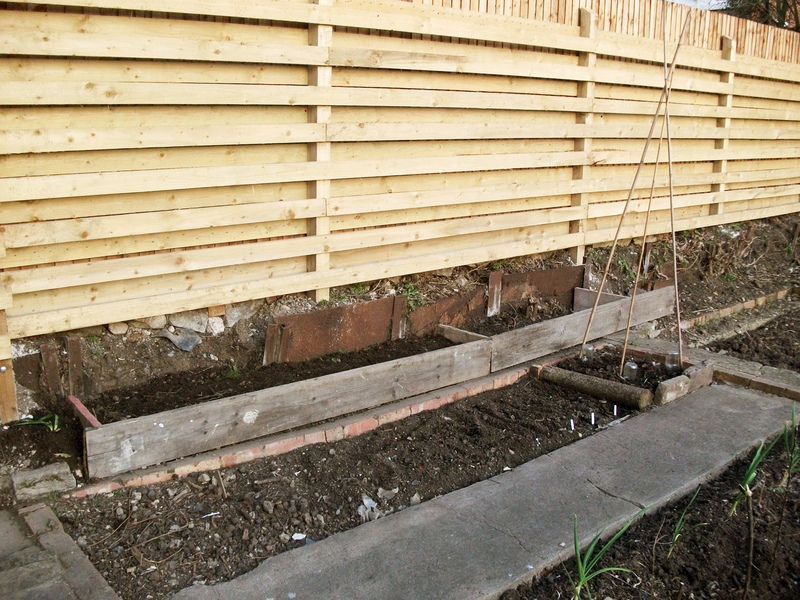 Those with a couple of screws and voilà, a raised bed! Now I’ve got to give them a lick of weather protector when I do the fence next month and find some compost to fill them with. I’m also in the process of “hardening off” some `sweet peas (I’ve jam jars on them at night which I take off during the daytime to get them used to the weather conditions outdoors as they were started off on the windowsill). 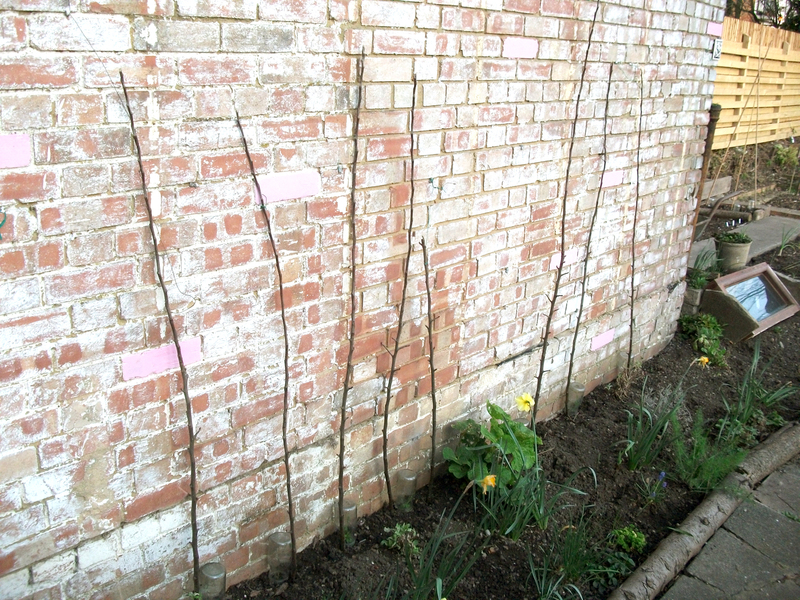 I couldn’t find any bamboo canes to put in to support the plants when they grow taller, so used the prunings off the apple trees from early this year as a substitute. I knew there was a reason I kept them! Last weekend I made myself a wormery which I’ve been meaning to do for a while now but my drill packed in a few weeks ago. When you see the price of the commercially sold worm-composting bins it’s definitely worth making your own. The main reason I made one is for the excellent compost I’ve been hearing a lot about and the liquid by-product produced, that can be used as great plant feed when diluted. Much cheaper and better than the chemical laden stuff you get for a fiver in DIY shops! Armed with notes from the excellent “worm composting in the city” course at the walworth garden farm and some research in the library the week before, combined with the purchase of a new electric drill from Wickes (£29.99 from their “no frills” range) I was ready to roll! The container is a plastic mop-bucket sized tub with a lid which was procured outside a shop in Theobalds Road (left out for the binmen) which I first gave a good wash out. I drilled a few dozen holes in the bottom (for the liquid to seep through) and the same amount 1” from the bottom and 2” from the top for ventilation. You could also drill some small holes in the lid for good measure too. I then put a good layer of well ripped up newspaper and (untreated) cardboard at the bottom of the tub and gave it a soak and left to drain out for a short while. 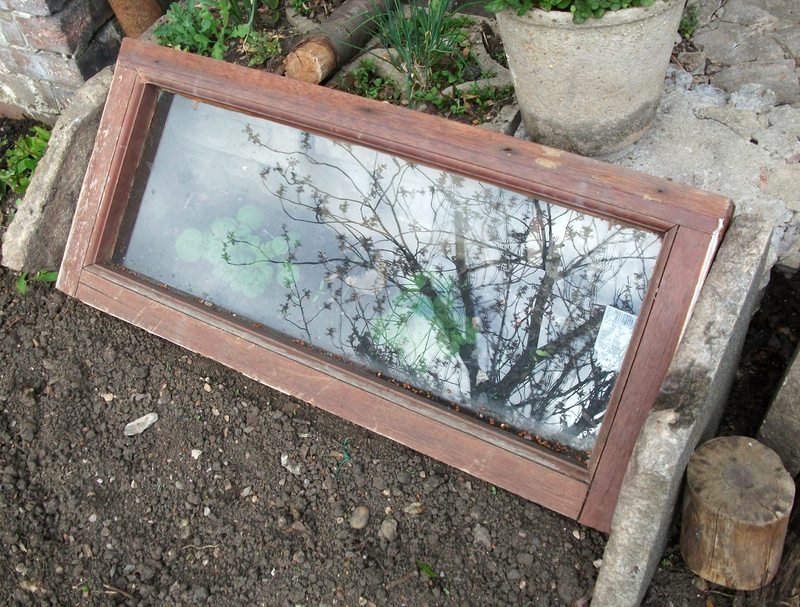 I then put in a layer of rotted compost from bin attempt 2, put the lid on and left overnight. In the morning I put in a handful of composting worms (tiger or brandling worms, available from fishing tackle shops, the internet, off a fellow composter or as Bob Flowerdew suggested, lay a sheet of wet cardboard on the ground and in a few days you’ll get the worms on the underside) into the container. You only need a few as they breed like crazy. I then put some a thin layer of finely cut up scraps of vegetable/kitchen waste in for the worms to feed on. They don’t need much at one time as they can only consume so much but they do like it regular so keep checking on them while making sure the compost doesn’t dry out and is kept just moist at all times. You can put in fruit and vegetable peelings, washed out uncooked egg shells, bread, leaves, dead flower heads, tea bags and coffee grounds etc. No meat, dairy products, oily foods etc as you don’t want to attract rats and mice even though it’s like catworld in our back garden! Once a month you should also add more fibrous material like ripped up newspaper and ripped up egg cartons. The bin can be left outside but a warm place like a garage or the like is better, somewhere sheltered so as not to get hit by extreme cold as the worms can’t tolerate being baked or frozen. You could always insulate the bin with bubblewrap or similar if you do choose to site it outside (check that the airholes don’t get blocked) and make sure the bin is never in full sun. Do remember to put a tray or something similar underneath the bin (mine is on two bricks to lift it off the floor) to catch the liquid that is produced. I will you keep you updated on how I get on and pass on any tips learnt as this is a first for me! Bucket: Free from outside a shop left out for the binmen. It was a lovely old day today so spent a couple of hours outside. I made a wormery after getting my hands on a plastic tub left out for the bin-men outside a shop on Theobalds Road the other week and used a handful of worms out of compost bin attempt number three. More about how I got on with it in a later post. Also, I’m now following “biodynamic guide to sowing and planting” by Maria and Matthias Thun to the letter. As today’s a root day to 8pm, I sowed a row of potatoes, carrots and beetroot. It’s early I know but I’ll take me chances with the weather. When I mention the biodynamic method to most people they think I’m daft saying such things as “ah ok?” and then changing the subject or say it has never been proven to work or think I’ve joined a mad gardening cult. Well as it costs nothing to try (apart from £4 odd for the book on amazon) you’ve got nothing to lose! Heard this a couple of times on Dr Strangedub and DJ Baby Swiss’ Echo Chamber on KFAI over the last few weeks. This is an excellent and catchy bit of tuneage. The instrumental is nice too! Whether you’re traipsing around the garden centre, glancing at seed packets or the catalogues, you’re more than likely to come across these couple of gardening terms. It used to confuse me to begin with but don’t let the terminology put you off! Hardy. Plants that have the ability to stand frosts and weather conditions that fall below freezing. Half hardy. Plants that are not completely hardy but can tolerate the odd light frost and cold night. Remember you can protect plants with cloches, jam jars, move pots under glass or into plastic mini-greenhouses, cover with horticultural fleece or even use net curtains! Tender. Plants that will not tolerate any of the above or as it says in the dictionary, “a plant that is incapable of resisting cold.” Well put! Annual. A plant that completes it’s life cycle (germinates, produces leaves then flowers and seeds) in one growing season so only lasts one year but remember some plants are great “self-seeders”. They set seed which lays dormant in the soil and germinates the next year so starts the cycle again. Biennial. A plant that takes two growing seasons to complete it’s life cycle. (In the first year it germinates, produces good growth and in the second, produces flowers and seeds). So simply, a plant that lives for two years. Perennial. Plants that regrow yearly usually from underground root stock. (Produces leaves, flowers and seeds before dying back at the end of the season). A plant that lives for more than two years. There you go, it’s that simple! The Morning Glory seeds I sowed the other week, alongside the many others adorning the kitchen windowsill (above) are now on their way. I took the plastic bag off when the seeds started to germinate, made sure the compost never dried out and turned the seedlings when they were leaning towards the light. If the seedlings were left in the tray, they would quickly become overcrowded which would lead to poor growth. The first set of leaves that appear are the plant’s seed leaves which are usually different to the ones that will follow so don’t fret if you think you’ve got something else to what you sowed. 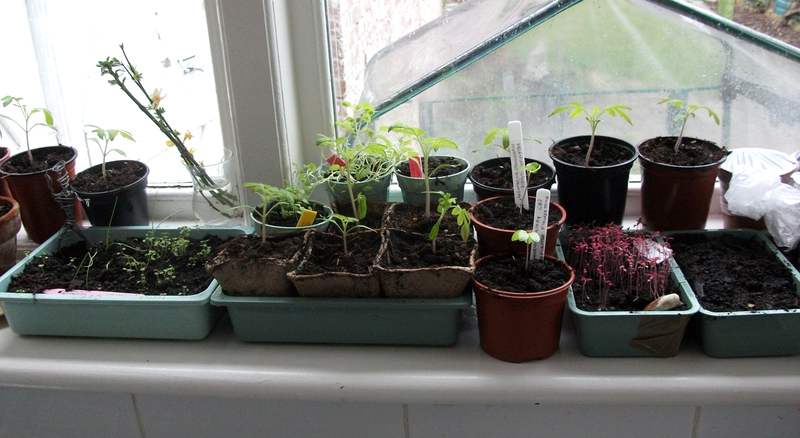 The seedlings are now ready to to be “pricked out and potted on” one to a pot or a few to a larger seed tray. Before potting on I watered the seedlings in the tray and let it drain on the side. I bought a big bag of (peat free) multi-purpose compost from the local garden centre and re-used pots that I’ve had for years which you can get for next to nothing especially the plastic ones (terracotta ones are a bit more harder to find). Have a look out for them in skips and beside dustbins in the summer months after people have visited the garden centre on their plant binges and are chucking them out. It’s good practice to give them a good clean and rinse before re-using to prevent disease. The first thing I did before filling my pots was to place a piece of broken crock or porous stone (small pieces of broken terracotta plant pots are ideal) over the top of the drainage holes. Then I filled it with the compost and lightly firmed it down. Give the pot a water if the compost isn’t moist already and drain it off. 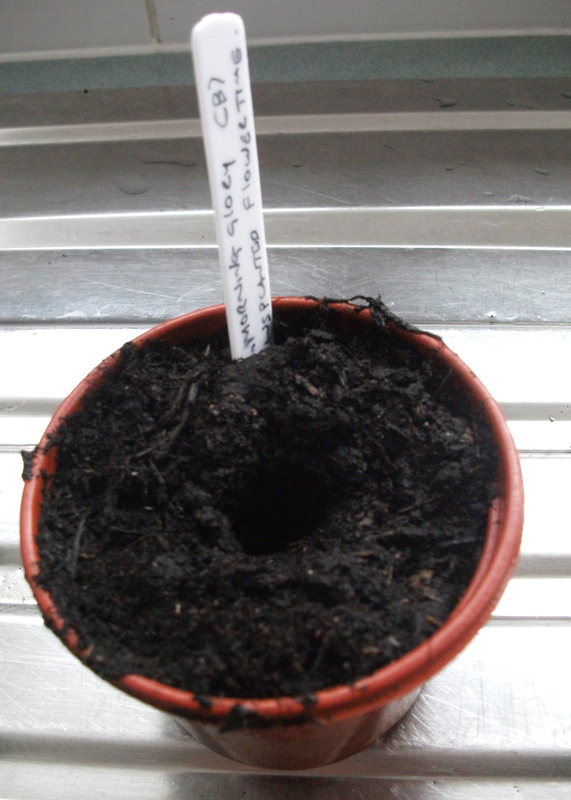 Make a small hole in the centre with your finger where the seedling will go. 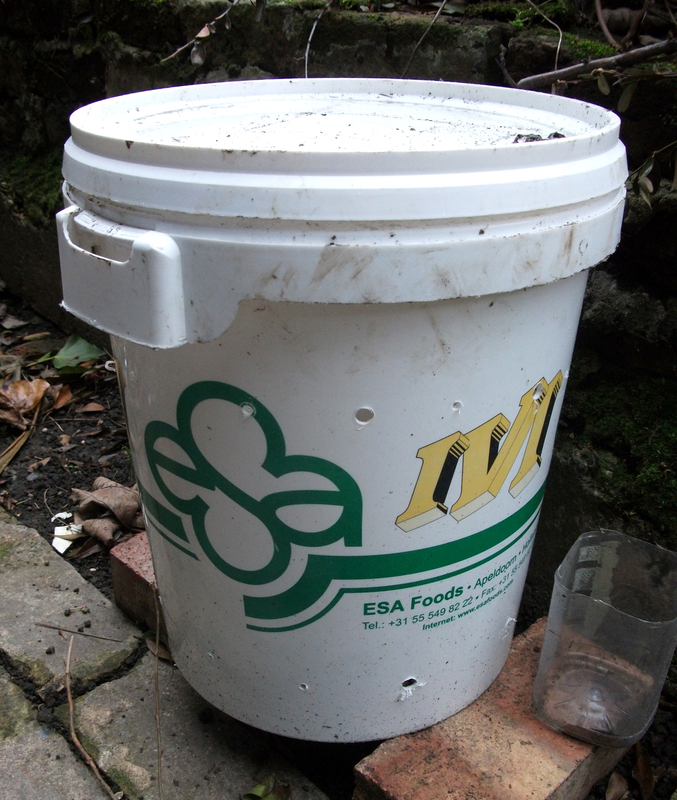 If the compost was kept outside in the cold the night before, make sure it’s well thawed out before using. Now place the pot somewhere indoors with lots of light like the kitchen windowsill. Check the pot daily making sure the compost is just moist and water from below when it looks and feels dry. 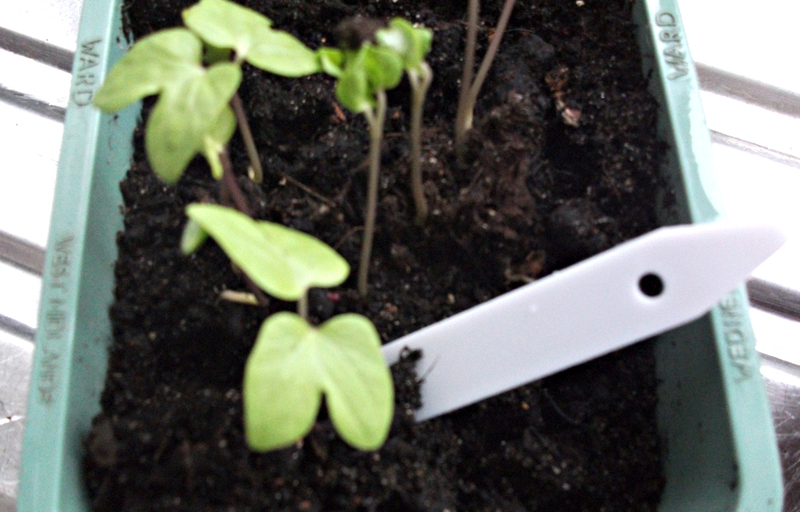 Keep turning the pot if the seedling is edging its way towards the light as you don’t want the seedlings to get leggy. Depending on the size of the pot, the plant may need to be moved again if there’s vigorous growth. Next post concerning the seedlings will be in a few weeks time about “hardened off” the plant to the outside weather as they are getting the good life indoors at the moment. Pot on my friend! Plant pots/trays: Free, found over the years and re-using pots that contained plants bought from the garden centre or been given off mates. Bag of peat free multi-purpose compost: Around £4 from the local garden centre which will last you a long while. 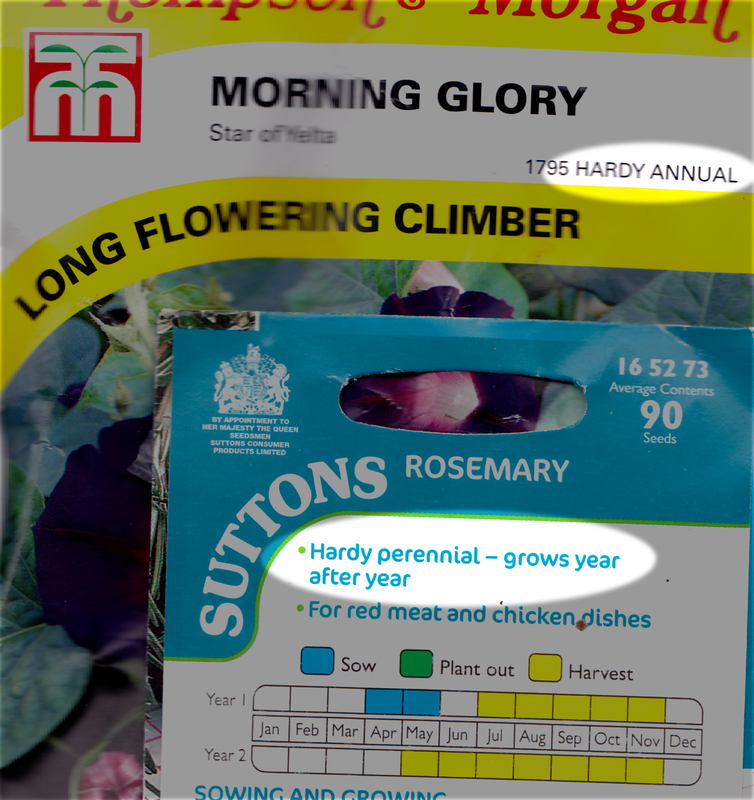 Plant label: 99p inc free postage for a pack of 10 off e-bay.